De Maisonneuve Boulevard between Atwater and Wood will be closed to car traffic April to December 2019 and March to December 2020. Dawson College’s de Maisonneuve entrance and the Atwater metro station will remain open. Access to the parking lot at 4011 de Maisonneuve Blvd. West will be maintained. Please see the FAQ below for more details. How long will the work last? The work is estimated to start at the beginning of April 2019 and the street will be closed to car traffic April to December 2019 and March to December 2020. Will public transit be affected? Metro service at Atwater station and bus service in the surrounding area will not be affected. Will Dawson’s parking lot be affected? Access to Dawson’s 4011 de Maisonneuve Blvd. West parking lot will remain open. A traffic control person will be stationed at the corner of Wood and De Maisonneuve to allow vehicle access for parking, daycare and shipping. What renovation work is being undertaken? The STM will completely replace the membrane that ensures the Atwater station is waterproof and will take advantage of the construction already planned to install two elevator shafts connecting the Metro mezzanine to the platforms. Will the work be noisy? The College has received assurances from the STM that its contractors will respect all laws and regulations regarding noise levels for both the City of Westmount and for Montréal for construction projects, and its engineers have promised to keep noise levels inside the Metro area where work is being done to established safe decibel levels between 80 and 106. Will the Dawson Daycare be affected? A traffic control person will be stationed at the corner of Wood and De Maisonneuve to allow vehicle access to the Dawson Daycare. Why were the trees on De Maisonneuve Boulevard cut down? The STM cut down trees and bushes on De Maisonneuve in preparation for the major construction work that will take place. At the end of the project, the STM will replant trees and bushes that are native to Quebec instead, increasing our campus biodiversity and providing additional food, shelter and nesting opportunities for local wildlife. Will emergency evacuation procedures be affected? Emergency evacuation procedures will not be affected. How will the closure affect those with reduced mobility? 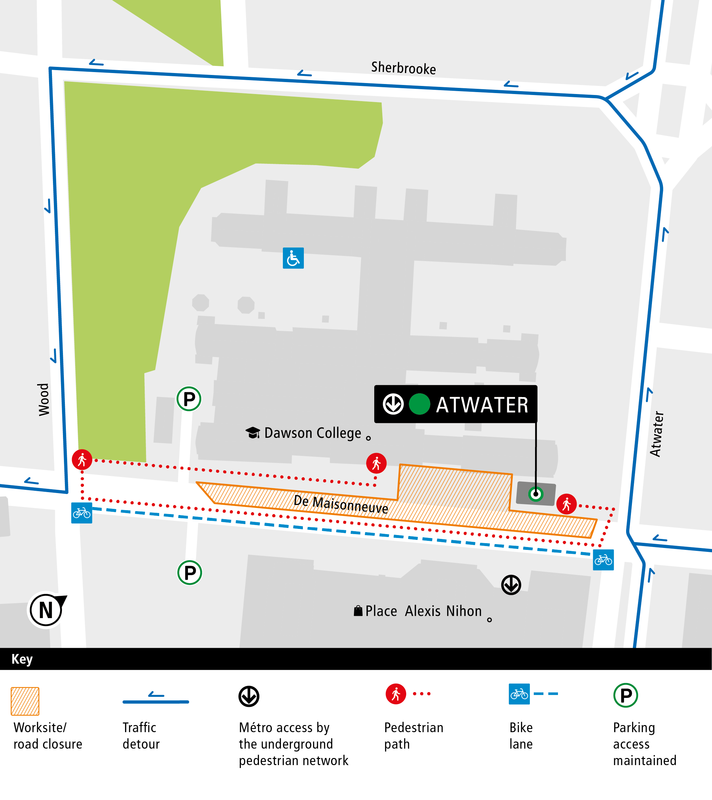 Transport Adapté will be able to enter Dawson College through the 4011 de Maisonneuve Blvd. West parking lot for drop-offs. A ramp and electronically-opening door will be installed at the B2 entrance to the College (its location is indicated on the map above). Where can I get more information about the closure? You can find out more about the STM project by visiting www.stm.info/atwater or calling 514-STM-INFO. For questions about the project’s effects on Dawson services, please contact Coordinator of Building Services, Veronique Paris (vparis@dawsoncollege.qc.ca, extension 1399).